I think this was our first ever family trip with just the four of us and was definitely a very fun bonding experience. 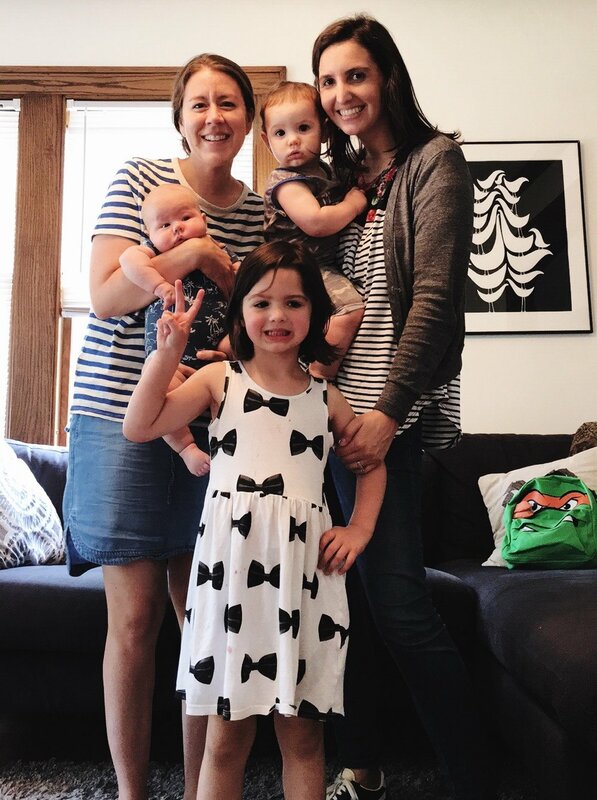 Eric had a work conference in Minneapolis so the rest of us went along for a couple days because 1) we love it up there and 2) it was a good excuse to go visit my friend Joa and meet her new baby, Rex! We seriously had the best time. Eric and I decided a couple days before we left that we would have way more fun if we threw out our rigid sleep schedule for a few days and just roll with it (Finch was going to bed at 5:00 back then, and we knew we did not want to be stuck in a hotel room all evening!). The kids did great with it, and it turned out to be one of the best decisions we made. Des Moines to Minneapolis is 3.5 hours via car. We drove up on a Wednesday, and Rooney didn't ask even once if we were "there yet," thanks to the VBS videos we had just put on her iPad. 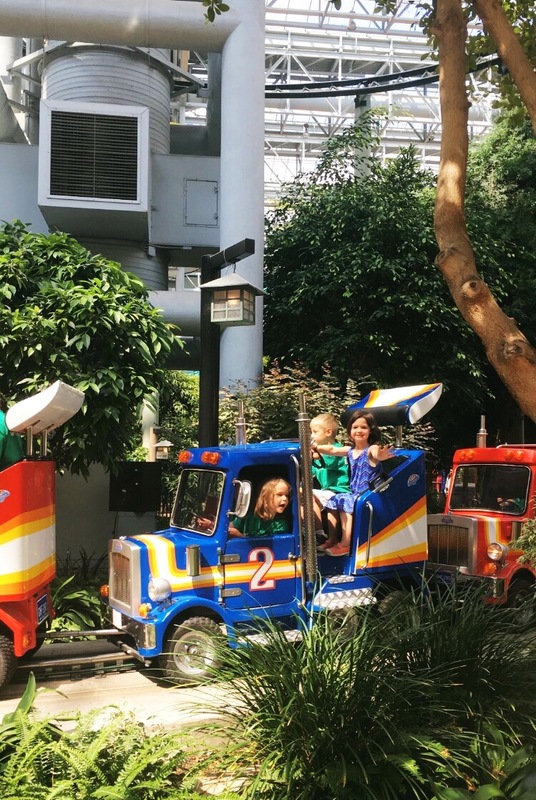 We drove straight to the Mall of America - which is the largest mall in America, and just so happens to have the largest indoor theme park in the United States, Nickelodeon Universe, right in the middle of it. We were on our way to buy ONE amusement park ticket for Rooney when a young gal walked up and handed us a pass loaded with 96 points (that's a $75+ value). What a HUGE blessing! It definitely made Rooney's day to go on several rides (we actually all went on a few). Eric hung out with Rooney in the amusement park while Finch and I snuck off to some stores. The mall has 520 stores (crazy!) and somehow it's still enjoyable to walk around. We walked around most of the mall, but if I'm in a hurry, my hot spots are H&M, Madewell and Urban Outfitters (UO has a photo booth!). Zara has opened since we were there, too! Shake Shack had just recently opened; I can never resist their burgers and shakes! YUM. We ended up eating there two days in a row :-) I super loved the Mall of America Concrete. The next day - Thursday - Eric had his conference. My friend Joa - the one who designed this blog - lives in Minneapolis and I don't get to see her enough, so I was so excited to get to spend time with her. She welcomed us into her home, served us warm banana bread, didn't care that my kids made huge messes, cooked us lunch, gave us homemade popsicles, and let us hold her very chubby new baby boy. We had wanted to go to Lake Calhoun but it rained all day so we just cozied in, nursed our babies and enjoyed each other's company. She's such a good friend. One of the very very BEST. Our boys are almost exactly one year apart! Joa gave us the awesome recommendation to check out Hi-Lo Diner the next day for breakfast. A 1957 dining car was driven from Pennsylvania to Minneapolis and it's now open for business! We got seated right away, and it was really yummy! Definitely would recommend. THE GLAZED DONUT. TAKE ME BACK. Eric made a quick pitstop at the Surly Brewing Co. to get some glassware (hopefully we can spend more time there on our next adults-only trip), and then we headed to Como Zoo for a couple hours! The weather was perfect and we got there right as they opened so it wasn't too busy yet. I remember going there when I was younger, so it was fun to bring my family. 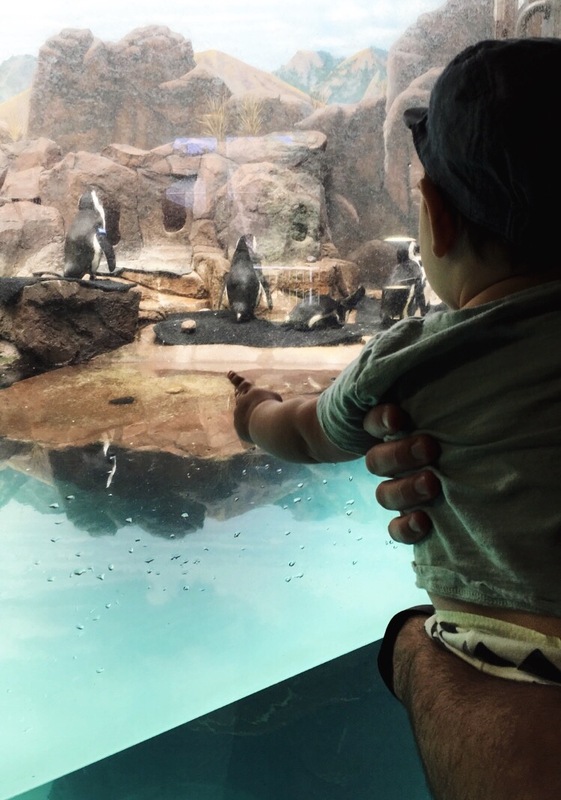 It's a really good zoo, especially for being FREE! I was so excited to see the polar bears because our local zoo doesn't have them. They also have zebras! Then it was time to say goodbye. Minneapolis, we love you. We can never stay away for too long. I already have a list of things I want to do next time! If you live in Minneapolis or St. Paul, I would love any recommendations you have!